Who’s that hideous, rotten corpse clutching the struggling torso of American Revolutionary hero Patrick Henry? 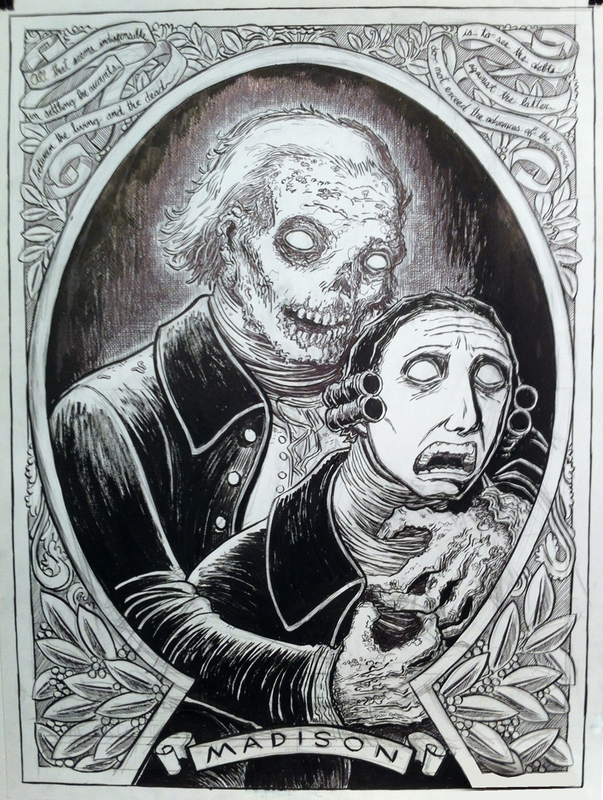 Why, it’s the zombie of James Madison (1751-1836), author of the Federalist Papers, of course! A bit of explanation may be necessary… I drew this as part of a 5-hour event at Dead End Press in Seattle, for their July 8th Zombie Founding Fathers sketch jam. Dead End Press is a new art studio in the Ballard neighborhood, and they’ve been doing a series of sketching events; there’s a new one coming up in August which I’ll post about later. I drew this in 5 hours, drinking Coke and kvetching with 12 other zombie-drawing artists, including Seth Goodkind, Jordan Giarrantano and Brian Britigan — basically, some serious competition. The final piece was drawn on 18″x24″ paper, and is now hanging on the wall at Dead End Press, which is why this image is just a cellphone photo. You can check it out at the Dead End gallery until mid-August. Today I’m working on new projects, but “The Doom That Came to Sarnath” will return next Tuesday! See you then! I like the particular zombified look you gave him, even to the bedraggled periwig he sports. Did some Necromancer do the deed? Some anti-Federalist wanting to get back at what was done to his country? I can see a short story in it.